Add a personal touch to your sock subscription with the GS Monogram service. 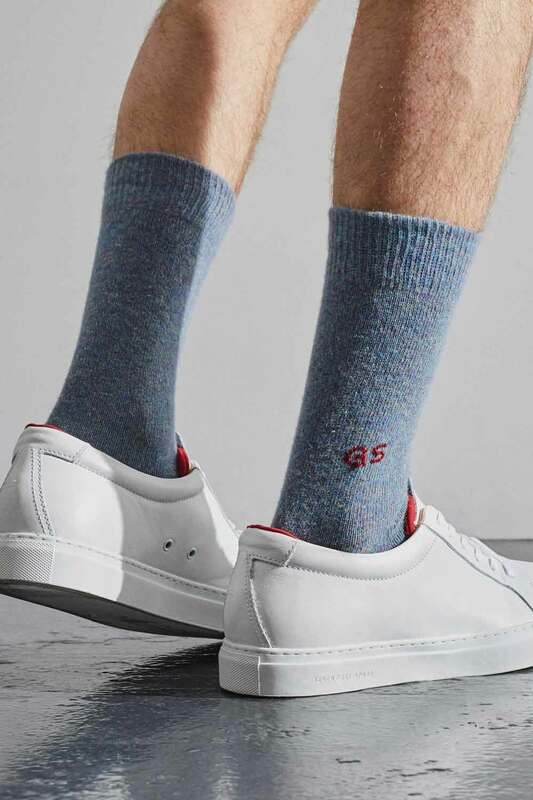 Introducing the GS Sock Subscription, a surprise pair of GS socks will be conveniently delivered to your door each month, choose from one to two pairs per month in sizes UK 4-7, 9-11, 11-13. Each month you will receive a surprise parcel of seasonal colours and patterns. 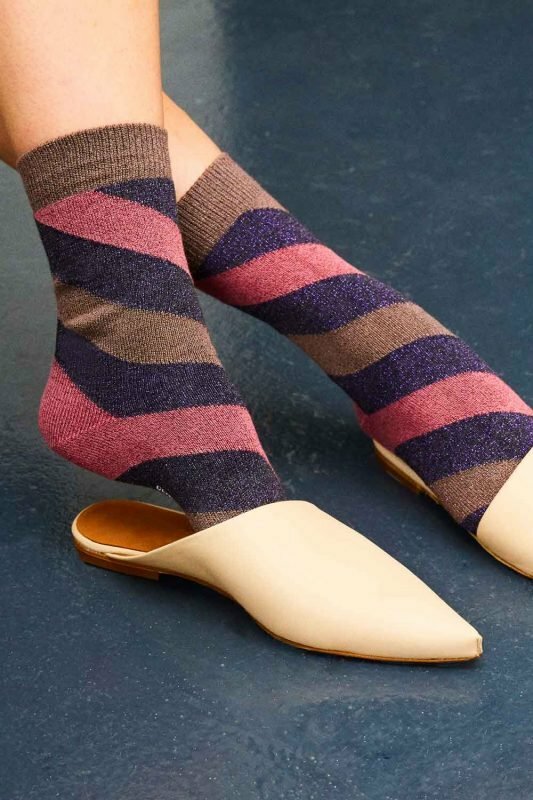 From sartorial favourites such as the Sotolino Mustard wool linen, the Solline silk tweed, to the sparkly Serora intarsia stripe, as well as some limited edition socks exclusive to the GS Sock Subscription. 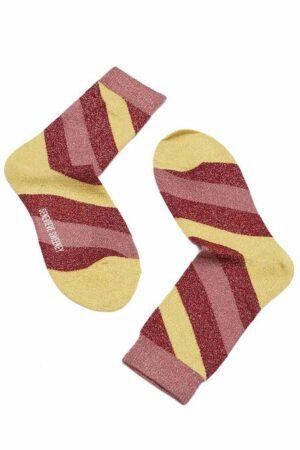 Genevieve Sweeney socks are made in Derbyshire by a family-run mill established in the 1930s. Knitted in luxury fibres with the highest quality finish to guarantee a luxury sock with an ultimate comfort that lasts. Treat yourself, or someone special and they will receive luxurious socks all year round. If you are going on holiday or would like to pause or cancel anytime, simply change your subscription by logging onto to you GS account. On your GS account, you can change the shipping address or payment method for future renewals and upgrade or downgrade your subscription at any time. Minimum of 3 months subscription. Thinking of gifting the GS Sock Subscription to a very special someone? Choose on the GIFT drop down options, to advise if you would like the first pair sent the billing address or directly to the lucky recipient (shipping address). The remaining monthly subscriptions will be sent to the shipping address. If you would like a shorter length subscription, example 3 months you can cancel the subscription via your customer account at any time after the third month’s subscription. Sock subscriptions ordered in sizes UK 4-7 will be sent ladies socks, orders for UK 9-11 & 11-13 will have men’s socks despatched, please leave a note on your order form if you would prefer otherwise. The GS sock has become the must-have accessory to all sartorial and stylish wardrobes with its attention to detail and high-quality fit. The perfect Self-Gift that keeps on giving. If you have further questions regarding the Subscription, please email me here or read the GS customer reviews on the review tab. The GS Sock Subscription can be personalised every month with up to three hand embroidered initials. Please see photo gallery for examples of socks you will receive in the GS Sock Subscription. Please note that the subscription can only be purchased through Stripe, not Paypal. Any subscriptions sent outside of the UK will have an additional shipping charge each month. The sock subscription has allowed me to treat my feet with gorgeous designs monthly with zero effort, straight to my door. The monogramming is beautiful and detailed and as an added bonus means no one else in the house can steal them….. Cant wait for next month, thank you! I originally bought some Genevieve Sweeney socks as a gift pack for both me and my husband back in December and I was really impressed with the designs and quality of the socks. I had planned to buy more over this year so was really happy when I discovered the monthly sock subscription had started. I signed up straight away and I haven’t been disappointed! The socks are of fantastic quality which wash up and wear really well. These are the only brand of socks I currently wear. I love that I’m sent different types of socks each month, from gorgeous sparkly socks to cosy wool ones. This means I’m starting to build up a collection of socks for every occasion. The socks are always delivered fast and are beautifully packaged. 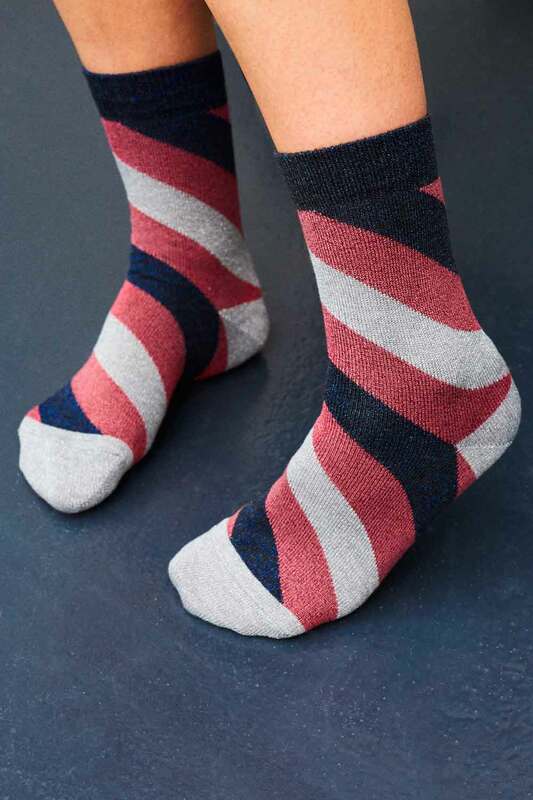 So far in the subscripton, I have received socks that I would have personally chose if I had been purchasing myself on the website which has really impressed me. 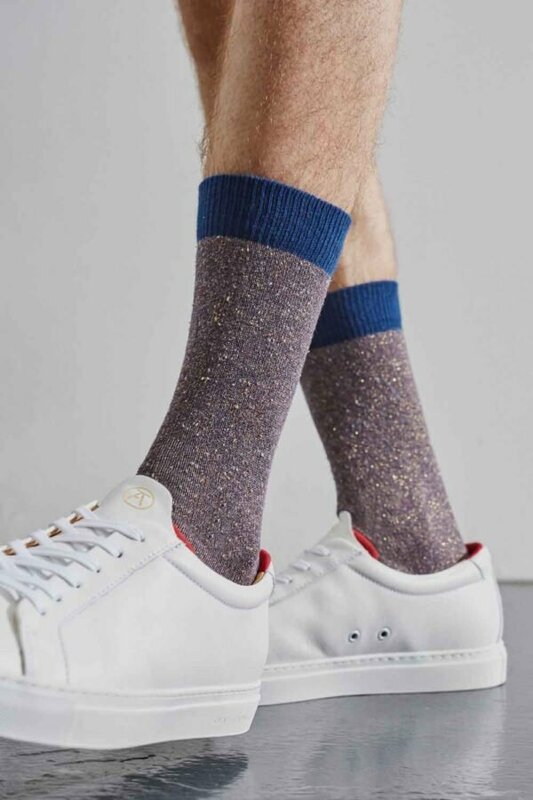 By signing up to the subscription service you can build up a beautiful collection of socks made in the UK (so at the same time you get to support the UK manufacturing industry) that can be worn daily and will last. I highly recommend! I treated myself to a pair of these socks, and was so impressed with the quality & how well they fit that I signed up for the monthly subscription. 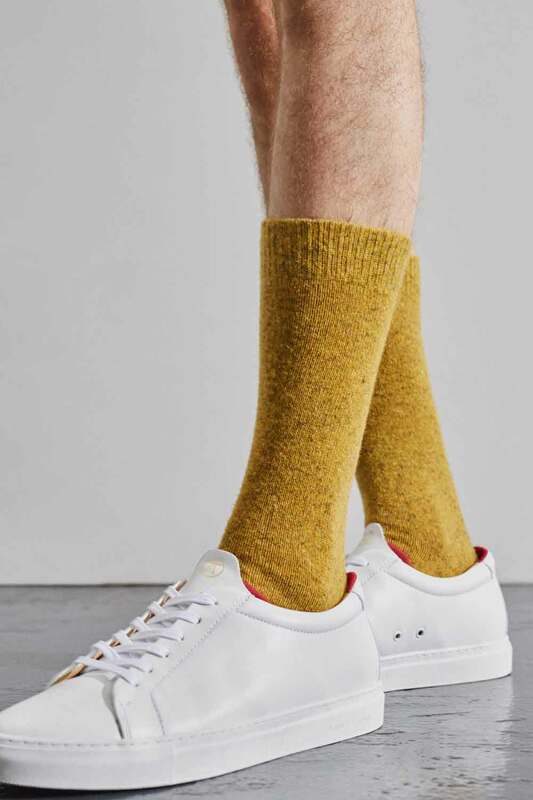 I always have trouble finding socks that stay up, without cutting into my leg – & these have just the right amount of stretch – really comfy & cosy too. I particularly love the wool & wool/linen blends, but the sparkly ones are fun too, and all in a lovely range of colours ! Initially I thought that it would be a good idea to save them up for Christmas presents this year, but I have been wearing them myself so will have to buy some more for presents later in the year! There’s nothing better than receiving a new pair of socks every month. I have been subscribed for a year and love every sock I have received, colours are always a great choice. I love this idea so much so bought a subscription for my sister for part of her Christmas present and it did not disappoint in the slightest. Genevieve went out of her way to find out what colours my sister likes and each pair has been tailored to ensure that she loves each one. I was also worried that the first pair would be sent directly to my sister randomly before I had the chance to wrap them up but there’s the option to have the first pair delivered directly to you and those thereafter delivered to the recipient which I was also grateful for. Highly recommend! Oh… and the socks themselves are amazing too!! Such a treat to receive these beautiful socks through the monthly subscription. The design and quality are both first class. Before I signed up for a sock subscription I only wore very basic, largely plain black socks, so I thought it was time to expand my horizons a bit. GS socks have opened my eyes to how comfortable (and fashionable) socks can be. Throughout the year the designs are always different and respond to the seasons so you might get warm woolly socks or festive Christmassy ones in autumn/winter and lighter bright colours in spring/summer. The materials used say they are of the highest quality using the best of British businesses and they do feel luxury as a result. New designs seem to be added all the time meaning there’s always a new monthly surprise, and they are all perfectly unisex; I even got my Dad a subscription with his initials on. The wrapping they are delivered in is also beautiful and put together with a lot of care which makes it a lovely thing to open – a monthly gift from me to me! I took out subscriptions for the monthly sock service as christmas presents for both my husband and a much loved uncle. My husband loves receiving the package each month – the quality of the socks is fantastic and he enjoys the designs. My uncle texts me each month with an update on which colour socks he has received, a thanks and invariably a photo of him wearing them . We have become firm fans of GS socks and will continue to buy them for ourselves and as gifts.